From the wood-burning fireplace to the covered back porch with oversized deck and beautiful creek views with two cascading waterfalls, Amy's Creek 1 is the perfect spot to unwind and enjoy the great outdoors. 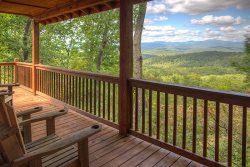 Amy's Creek 1 is a convenient 7 miles to Alpine Helen GA with its many attractions and events, and just 4 miles to Sautee with restaurants, shops and the village market. The knotty pine interior walls in this cozy cabin rental will convince you that you really needed a break from the city and workplace. Listen to the gentle waterfalls from the covered back porch with large open deck, or enjoy the creek a little closer around the beautiful stone fire pit with seating area. Amy's Creek is the perfect place to relax and enjoy the great outdoors. 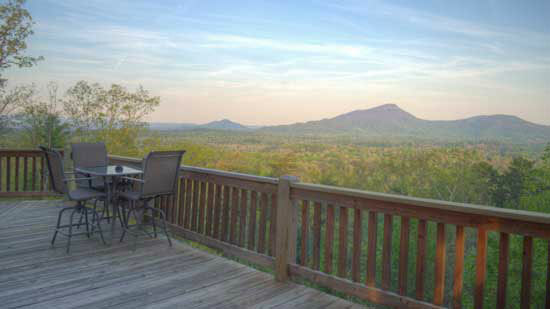 This Pet Friendly 2 bedroom, 2 bath vacation cabin comfortably sleeps 5. You'll have all the conveniences of home with a newly upgraded kitchen with stainless steel appliances. The main floor bath was just upgraded in Feb 2017 with a full natural tile walk-in shower! Relax in the leather sofa and swivel chair, and enjoy a warm fire with the REAL wood burning fireplace! Amy's Creek 1 also has a Flat Screen TV with Satellite & VCR, hot tub, and gas grill on the covered back porch area! A large open deck built around one of Amy's beautiful trees, also has outdoor dining and beautiful views of Amy's Creek. You'll feel like you're in a tree house! • Gravel roads and driveway, gentle inclines, accommodates up to 3 cars. Amy's Creek is approx 7 miles from Helen! Most of my experience was handled online and was fast and efficient. I often take candles with me to cabins because they can sometimes have an odor but this cabin had no odor, was clean, updated, well kept and well stocked. We didn't have a single problem or complaint. I would definitely stay at one of your cabins again. Thank you for a great home away from home. When I realized I had accidentally deleted the email with directions and code for the cabin, it was immediately handled. Really enjoyed the cabin. Cozy. We hadnt been on vacation up until now. Not even for our honeymoon. We really enjoyed our stay at Amys Creek 1. Our toddler had a BLAST!!! Thanks so much!! My stay in the cabin was excellent. Great customer service, answered all questions we had. We enjoyed our weekend getaway- it wasnt long enough! Cant wait to visit again soon!! No interaction other than thru email, which was friendly. My friends and I enjoyed out stay at the cabin. It was a nice place to get away, be alone, and relax while enjoying nature. The creek below the cabin was nice to walk down to a listen to the white water. We go to Oktoberfest every year and will be returning next year! Very clean. Quite. Hot tub awesome. Everyone was great! Loved the tips in the email - great local knowledge! We really enjoyed the coziness, especially as it was just the two of us and our dogs - being able to have them was a big plus for us. They loved the property and one of them especially loved the creek:) We look forward to going back again soon! It was extremely easy to email all information needed to reserve the cabin and the responses were sent given immediately. Thank you for having a pet friendly cabin! The ramp leading up to the door was great! Especially when you have to unpack in an outer band of a hurricane! Being a special education teacher seeing an ADA compliant cabin was wonderful. My 11 year old miniature schnauzer had the best time as well! He was acting like a young puppy in that wonderful fall mountain air. We loved every minute and hated to leave! The property is perfect and just what we wanted. We plan on making this an annual destination. Can't wait until next year! Everyone was very helpful and friendly. I like talking to real people!!! We loved every minute of it! We are already making plans for a return visit!!! Thank you!!!! Everyone was very nice. Enjoyed the whole experience! Was nice to get away! we saw some deer running across the yard. The water was a bonus. Everyone we spoke with was very friendly and knowledgeable. We loved the cabin, and the king size bed was so comfortable we didn't want to get up in the mornings. Can't wait to visit again!!!!!!!! Your team was fantastic and handled every thing as they said they would. We had a blast. Very relaxing and enjoyed our stay very much! Always able to contact staff, always very informative,friendly, and helpful. Loved our family stayed with our family dog. Very peaceful, and restful stay for us. Had every thing we needed. Thanks a lot. Will be recommending to family and friends. My contact was through email and I always received prompt, courteous responses. We so enjoyed the stay and look foward to visiting with you again. It was the perfect location, size and had all that we were looking for. Great place for a couple! Not sure but the one call I remember making. Jill was pleasant as can be..
Lovely cabin on a beautiful property. The sound of the birds every morning with the babbling creek was a lovely way to wake up every morning. It was so quiet and peaceful. Amenities are close enough to be convenient, but not too close as to interrupt the natural setting of this property. I recommend staying at Amy's Creek. We loved this cabin on the creek and its location! What a nice weekend escape!